Combine all the ingredients for the marinade in a saucepan, and cook on medium heat until the sugar is dissolved. Set aside to cool. Once the marinade has cooled, add it to the chicken/veggie mix. Combine. Refrigerate until you are ready to cook it. To transfer it for camping, just make sure to keep it in a cooler with ice. 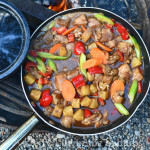 Serve over rice, which you can also cook over the fire!